Categories > Card Magic > Card Clips: What Are They, and Why Get One? Card Clips: What Are They, and Why Get One? If you're reading this article, then you probably love your decks of custom playing cards. Don't worry, I love my decks of custom playing cards too! There are few more satisfying things in life than opening a brand new custom deck, riffling through the cards, and enjoying the creative designs. Whether you're a collector, a card gamer, a card magician, or a cardist, what we all have in common is a shared passion for and appreciation of nice playing cards! If you're at all familiar with the world of playing cards, at some point or other you're going to come across mention of card clips. "Card clip? What exactly is this? ", we wonder to ourselves. Well I'm here to answer your questions, tell you what card clips are, why they're used, and whether they're worth getting. What Is a Card Clip? 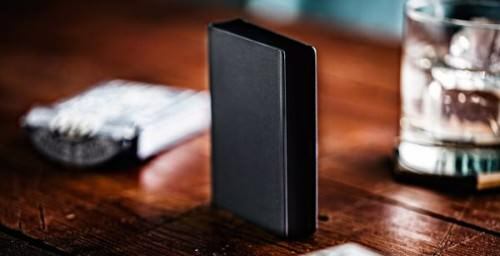 A card clip is typically a U-shaped metal container, the size of a deck of playing cards, and into which you can snugly fit a single deck of cards - including the tuck box. Besides the obvious metal protection they offer, one of the most important features of a card clip is the natural spring that is inherent between the two opposite sides. This ensures that your deck is wedged firmly between two pressure points, and helps keeps the cards flat, and can even straighten out a warped deck. Joe Porper is often credited with pioneering the concept of a card clip, and is still regarded as a leading creator of card clips. Today card clips can come in a wide range of styles, and even colours and designs. But typically the concept of a card clip hasn't changed: it's a protective metal carrying case for your tuck box. What are Card Clips Made Out Of? 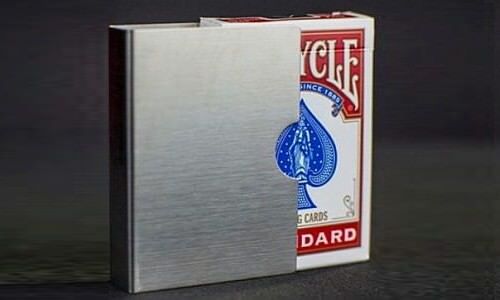 The materials used to make a card clip can vary, but typically they are made out of a single piece of metal that is bent into the necessary U shape for housing a deck of cards. Some are made out of stainless steel, others out of carbon fiber, and others out of metal alloy with a brushed metal, textured metal, or gun metal look. They are most commonly made out of metal, simply for reasons of durability. A cheap metal card clip can easily get bent out of shape, in which case it won't do its job properly, so you do want something that will last. The weight of a card clip will depend on what metal they are made out of. A stainless steel or brass card clip looks beautiful, but can be quite heavy. Card clips made out of aluminium are obviously much lighter. I own a very light-weight carbon fiber card clip that was produced by Legends Playing Card Company, and it's among the best you can get. It's only half the weight of a typical metal clip, so it will not make your pants start sagging when you load it in your pocket! It's also super strong - I'm told that it's made with the same technology used to create F1 racing cars! It's advertised as follows: "Around the weight of 12 playing cards, this solid carbon fiber card clip is stronger than steel!" That means it is very durable, and won't easily bend - as it shouldn't. But before you get your heart set on getting a carbon fiber card clip, be aware that they are also quite a bit more expensive than a normal card clip! The most important thing about a card clip is that needs to be durable, after all it is intended to function as a second skin for your deck, much like a helmet or set of armour. That makes metal an ideal choice, and in the end how much it weighs is not really the most important thing. Fortunately there are some good quality metal card clips available that won't break the bank. What Do Card Clips Look Like? Obviously, card clips are typically the size of a standard card case, since they are designed to have a single deck fit neatly inside. But since they are usually made out of metal, they can feature a range of attractive designs. Often they will feature a different design or logo on each side. The design might reflect a playing card publisher, brand, or even depict a playing card. For example, you will find card clips that boast the Dan and Dave brand, others that depict the Black Tiger deck tuck box, or a classic Ace of Spades or Queen of Hearts. Some card clips also incorporate a card reveal somewhere, so that they can be used for magic. Others have a metal weave or pattern, for a more simple and stylish look. There are also plain card clips on the market, which have no decorations whatsoever and offer a more minimalist look. While card clips typically have a brushed metal or gun metal look, because they are usually made out of stainless steel or metal, you will also find that they are available in a range of different colours. Grey and black are by far the most common, but can certainly get card clips that are white, gold, blue, red, or almost any colour that you prefer. For the ultimate luxury look, some custom metal card clips are finished off by having them bound with leather, or with more exotic coverings like alligator skin, shark skin, and even eel skin! But these are typically rare, made in highly limited or one-of-a-kind editions, and will set you back a pretty penny! How Do You Use a Card Clip? Every deck will have a slightly different thickness, depending on the card stock used, so there's no capacity standard for a card clip. The capacity of a particular card clip may vary slightly, although if you need to make your card clip slightly narrower or wider, just apply brute force and either compress the two opposite sides together or pull them apart slightly. The danger of doing this with a cheap card clip, of course, is that if the metal bends too easily, it won't keep the cards tightly contained in a happy pressure environment. Most of us humans don't deal well with pressure, but card clips are happiest when the pressure is on, and when they are wrapped around a deck as tightly as possible. A tuck box and a card clip deserve to be in a close relationship - in fact as close as possible! While soft metal clips can bend too easily, the one down side of a carbon fiber clip like the one I have is that you can't really adjust the size capacity at all, because it is almost impossible to bend. Sometimes a strength is also a weakness! I find that in most instances 52 cards will fit inside my card clip nice and snugly. As a result, I usually have to take out the Jokers to make this work. Having it fit too tight can make it difficult to remove the deck, and will inevitably cause damage to the tuck box when trying to squash it inside, and that's not what you want either. I've tried decks from different publishers, including USPCC, LPCC, and others, and they all fit fine, but sometimes I do need to take out an extra card or two. Playing cards come in different thicknesses, so this is only to be expected. 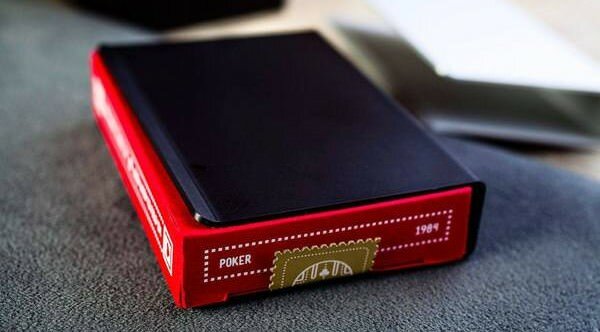 It is also important to make sure you have enough cards inside your deck, because if the stack of playing cards is noticeably thinner than the tuck case itself (which may happen if you've removed advertising cards and jokers), the card clip will compress and cause damage to the tuck box. I also find that leaving part of the cellophane wrapper around a tuck box gives it additional protection when housed in a card clip, and I'd certainly recommend doing that if you can. In your efforts to protect your deck, you don't want to be destroying beautiful embossing or foil accents in the process, and I find that the plastic wrapper assists with this. I usually keep a wrapper along with my card clip, and first pop a deck in the wrapper before squeezing it into the card clip. I also find that wiggling the deck back and forth is the best way to get the deck in and out of the clip, without doing damage to the box. After all, it is a tight fit - because that's the whole point - so it would defeat the whole purpose if the deck fell out just by holding the clip upside down. What Are Card Clips For? 1. Protection: The main function of a card clip is to protect your deck of playing cards. Custom playing cards aren't cheap, and if you've invested some moolahs into getting a quality deck, it makes sense to look after it. It's not hard to damage a deck of cards permanently - you only need to walk around for a day with it stuffed in your pants pocket to know what I mean. That's where a card clip comes in. 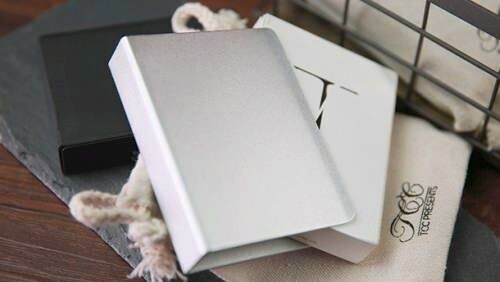 Made out of metal, it will protect your deck of cards from getting damaged or warped, even if you're carrying around in your pocket all day. It's effectively like adding a snug suit of armour around your deck before bringing it into battle. But the protective benefits of a card clip shouldn't be overstated either. It's important to realize that a card clip tends to protect only a couple of sides of the deck, leaving the others unprotected. So it goes part of the way from protecting your deck when it is jumping around in your pocket, but does not offer full protection. Card clip protection doesn't mean you can throw your deck around, or let it fly about in the glove compartment of your car! 2. Prevention: Card clips will especially be of benefit in humid conditions, which can quickly can cause a deck to warp or go out of shape, immediately affecting its handling and performance. By storing a deck in a card clip, there is less likelihood that the cards will curl or that the deck will warp in the first place. This isn't just true when your deck is sitting in storage, but it's especially true when it's sitting in your pants pocket. A deck that's pressed tightly against your body is not only going to be squashed out of shape, but it is also going to warm up. Your deck may feel comfortable in your pocket at first, but it's quickly going to start becoming clammy and hot, and changes in temperature and fluctuating levels of moisture are a sure-fire way for causing your cards to warp. The constrained space of a pocket will also put pressure on the corners and sides of your deck as well, causing damage to the tuck box. 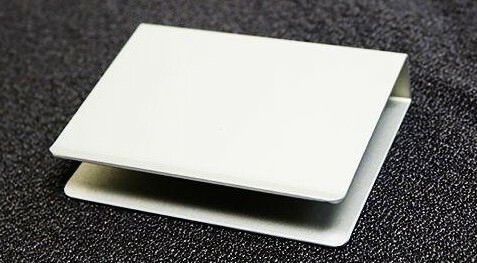 A card clip will only partially prevent damage to the tuck box, but the more important function that it performs inside your pocket is that it will prevent your deck from bending and warping, ensuring that your deck is ready to perform when you do lay your cards on the table. 3. Restoration: In some cases, a card clip can even help straighten out a warped deck. With general use and under the pressure of multiple shuffles and cardistry moves (and perhaps some less kind treatment in the hands of your well-meaning friends or family, or perhaps even yourself), playing cards will cop a bit of a battering. They will inevitably go a little out of shape, and look a little bent, warped, or tired. The solution is simple: store your tired deck inside your card clip overnight, and by morning it will be feeling better already. Just like a good night's rest does us all some good, so your deck will love spending some time tucked snugly between the covers of your card clip. You can even leave it this way for a few days if necessary. A few days of card clip therapy won't make every deck look brand new, obviously, but it will certainly help straighten things out somewhat. You will often find that by giving your cards a break in this fashion, within a day or so the cards will handle better again. Of course you can produce a similar result by leaving your deck under a pile of books or under a heavy table for a week, but that impractical and inconvenient, not to mention that it also looks unsightly. 4. Accessory: There's nothing wrong with having good looks. 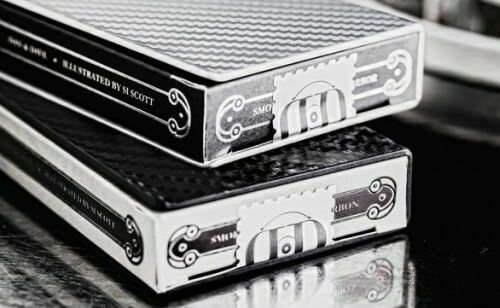 In fact, if you love custom playing cards, then I don't need to convince you on this point, because you're already a convert to the aesthetically beautiful! The good news for fashion lovers is that card clips offer fantastic looks in their own right, especially when they have a metallic look, or have added patterns and decorations. The clip I have has a matt 3k twill weave, with an attractive and eye-catching pattern. You'll even find high end card clips that are inlaid with abalone shells or other features that we're used to seeing only in the world of jewellery! Many more affordable designs and finishes are available. You can opt for something that has a more plain textured look, or is decorated or engraved with designs of playing cards or your favourite brand. There's certainly no shame in pulling a card clip out of your pocket before putting a deck to work; on the contrary, it looks stylish and impressive, gives an immediate sense of class and flair, making it the perfect accessory for the lover of playing cards. As an accessory, it can be considered as an extension of your personality, with a look and feel that matches your own style. How Much Do Card Clips Cost? You can pick up an "el cheapo" card clip on eBay for as little as $5. These are made and shipped in China, so you will likely be waiting for some time for it to make its way to your doorstep. Furthermore, these are typically cheaply made, and are likely to be quite heavy. One of the important things about a card clip is that it needs to hold its shape well. In other words, the metal needs slight flex, but shouldn't bend too easily either, so that it remains out of shape, because the whole point of a clip is that it can create a constant pressure on both sides of your deck. You may find that with a cheaply made card clip that this becomes a problem, and that the opposite sides start looking like the widely splayed legs of a giraffe, and sadly stay that way. Not ideal. As they say, you get what you pay for. But by all means give one of these a shot, and perhaps my pessimism won't bear out! A very good card clip, on the other hand, from a reputable supplier like Legends Playing Card Company (LPCC) or Dan & Dave, will cost you quite a bit more money. You can see the range at LPCC here and at Art of Play here. Art of Play offers basic card clips for around $40, and these are good quality lasting clips that do their job well. Porper Card Clips (made by Joe Porper) are often considered to be among the best, and these can be found for a similar price. LPCC card clips on the other hand are more luxurious and stylish, and their basic card clips range from $80-100. But these more pricey clips are made out carbon fiber, and in some cases use the same metal technology used in Formula 1 racing cards, so they won't easily get out of shape! At the upper end of their range is an Alligator X Carbon Clip that costs $380, which is also made out of carbon fiber, and described as follows: "Coated in genuine Alligator skin, and finished with our exclusive hand-painted process to coat the edges, the same process used by luxury brands like Louis Vuitton and Dunhill." Joe Porper also makes luxurious and high end card clips in very limited numbers for big name designers and publishers. 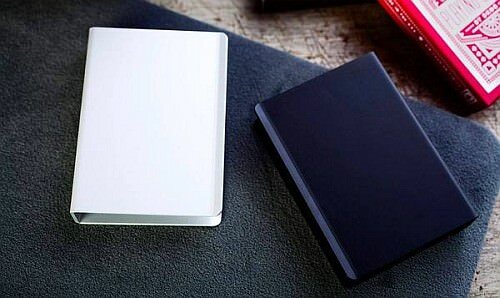 This is the kind of thing you can expect to see celebrity magicians like David Blaine using and carrying around. If you can afford luxury name-brand clothing, perhaps this is something for you. But for the rest of us, high end card clips like these will usually be out of reach, and even a $20-40 clip will do the job just fine! MPC offers custom card clips that are handcrafted or laser engraved with the image of your choice. The range at PlayingCardDecks here starts at around $10, so you can certainly get something decent without spending a fortune. You will find that opinions on the overall usefulness of a card clip can vary, and it is true that its benefits shouldn't be overstated. They do need to be used correctly, because there's real potential to damage the tuck box if used incorrectly. And you do need to realize that card clips only offer limited protection when inside a pocket, so don't expect a deck inside a card clip to be bullet proof and immune to all damage. But in the long run, a card clip will certainly increase the longevity of your playing cards, by providing extra protection and thus ensuring greater durability. It's especially useful for preventing your cards from becoming warped while being stored, especially in a humid environment. And it's also useful for straightening out a deck that has become warped. If I'm walking around with a single deck in my pocket, I try to get into the habit of only pocketing the deck when the protective and light-weight armour of my card clip is there as well. And if a deck is starting to look or feel somewhat warped, into my card clip it goes overnight, and chances are it will be in better shape by next morning. Besides all this, card clips make great accessories for anyone who likes playing cards, and provide a visible statement of style and class. A high end card clip isn't cheap, but the quality is usually evident immediately, both in looks and in function. If you have your heart set on a carbon fiber product, you can expect to pay accordingly, but even a $20-40 investment should get you something you'll be happy with. Either way, you will find yourself the proud owner of a long-lasting and functional product that also looks fantastic. That makes card clips ideal gifts for the serious card enthusiast, and useful accessories for the person who is constantly walking around with a deck in his pocket. So if you love playing cards - and I know you do - you owe it to yourself to consider treating yourself and your cards to the royal treatment that they will find inside the covers of an attractive card clip! PlayingCardDecks has several card clips available, and you can always check the Accessories category to check for new items that have been added to their catalogue. Author's note: I first published this article at PlayingCardDecks.com here. I bought a couple of el cheapo clips many moons ago, paying far too much, and quickly found them deficient and ineffective. I tossed them and replaced them with a couple of the Porper clips, paid around $25 - $30 apiece. In my opinion they have proven a great purchase. Living in the humid Southeastern US, cards carried in pants or shirt pockets can get super sticky and difficult to handle. The Porper clips work perfectly, keeping the cards flat, dry, and ready to work with. and they are practically indestructible. Had 'em 12 or so years and they still look new. $80- $100 per clip? Nah, too much. As for $380?! Puh-leese! I agree with Anthony. The Porper clips are great. I have four of them. They really keep the deck safe and also flat. Great item.